Bhutan is small country nestled in the heart of Himalayas, landlocked between the Tibet Autonomous Region of China and India. Also known as "The Last Shangrila", the kingdom of Bhutan has a strong sense of culture and tradition that binds its people and clearly distinguishes in the world as one of the last remaining Buddhist Kingdom in the world. The land of the thunder Dragon or “Druk Yul” as locally known, Bhutan is democratic, constitutional monarchy presently headed by the king Jigme Khesar Namgyel Wangchuck. It has developed the philosophy of Gross National Happiness; where development is measured using a holistic approach of well-being, not just based on gross domestic product. Largely known for its monasteries, fortresses (or dzongs) and dramatic landscapes that range from subtropical plains to steep mountains and valleys, Bhutan is a unique country both culturally and environmentally. The colourful festivities of Buddhism, the peaceful, warm hearted and hardworking people of Bhutan immortalize their presence in your memories. The seeds of tantric Buddhism in Bhutan is said to be sown by Guru Padmasambhava himself in the 8th century. Today Bhutan is the last stronghold of Vajrayana Buddhism. ​The world’s one of the most famous monasteries that clings to a mountain cliff, the Taktsang Palphug Monastery or the Tiger’s Nest is situated in Paro, Bhutan. A distant view of this sacred place is enough to run chills through your spine. A hike to this monastery will leave you spell bound with its mastery, artistry and spectacular views of the valleys around. A World Heritage site, this monastery is featured prominently in the National Geographic book “Sacred Places of a Lifetime,” a showcase of the world’s most powerful and spiritual places. The capital of Bhutan is Thimphu, the heart of this Himalayan country. The views of while snow clad mountains and a fresh breeze of gushing Himalayan air is always around to refresh you to your soul. Tourism in the country is highly controlled and restricted by the government but the Indian tourists can have easier access to the Kingdom compared to other foreign citizens. Phuentsholing serves as the convenient entry/exit point for Bhutan and also the important link to visit the Indian state of West Bengal, Sikkim and Assam. Thimphu: The capital of Bhutan which presents introspect into the rich Bhutanese culture in the modern day world. Taktsang Monastery or the Tiger’s Nest: an exceptional world heritage monastery that hangs on a cliff and stands above an enchanting forest of blue pines and rhododendrons over the Paro valley. Punakha Dzong: Punakha once served as the capital of Bhutan. Punakha Dzong is the country’s one of the oldest, most gorgeous and majestic dzong (fortress) placed strategically serving as the religious and administrative centre of the region. This placed has played an important role in Bhutan's history. Wangduephodrang: Wangduephodrang is the last town on the central highway before central Bhutan. Trongsa: Trongsa forms the central hub of the nation and is the place from where attempts at unifying the country were launched. The Chendbji Chorten (memorial), patterned on Swayambhunath temple in Kathmandu can be visited from here. 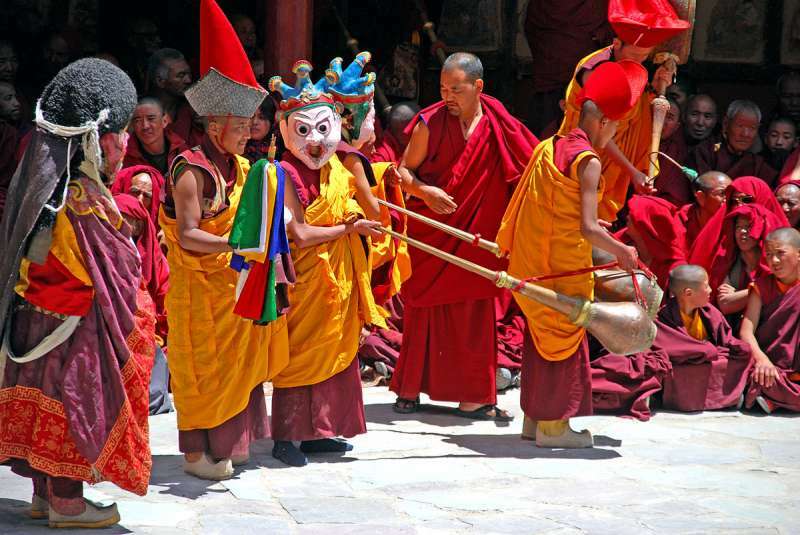 Bumthang or Jakar valley: The deeply spiritual region of Bumthang is shrouded in religious legend. Bumthang is also the traditional home to the great Buddhist teacher Pema Linga to whose descendants the present dynasty traces its origin. Mongar: Gushing waterfalls, steep cliffs with even steeper drops, blazing flowers and constantly changing vegetation combine to make this journey as varied as it is beautiful. Mongar marks the beginning of Eastern Bhutan. Trashigang: Trashigang, once the centre of a busy trade route with Tibet, is today the junction of east-west highway with road connecting to Samdrup Jongkhar and then to the Indian States of Assam. This town is also used as the market place for the semi nomadic people from Merak and Sakteng whose costumes are unique in Bhutan. Samdrup Jongkhar: Samdrup Jongkhar is a convenient exit town for tourists who have arranged to visit the neighboring Indian state of Assam. Phuentsholing: The frontier town, it is a thriving commercial centre, situated directly at the base of Himalayan foothills. It is a fascinating place where different ethnic groups mingle prominently Indian, Bhutanese and Nepalese. Paro: The beautiful valley of Paro encapsulates within itself a rich culture, scenic beauty and hundreds of myths and legends. It is home to many of Bhutan's oldest temples and monasteries, National Museum and country's only airport. 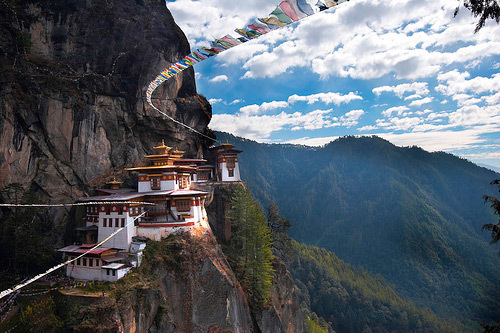 The tours to Bhutan are a unique experience for each visitor.